The Caribbean is a complex maritime environment, with multiple countries and territories, significant seaborne commerce and a wide variety of threats to safety, security, stability, the environment and sovereignty. A diverse group of stakeholders gathered in Providenciales, Turks and Caicos Islands (TCI) to discuss those challenges and reaffirm their commitment to address them. A major theme throughout the conference was that partnerships and collaboration are important to achieving maritime security in the region. 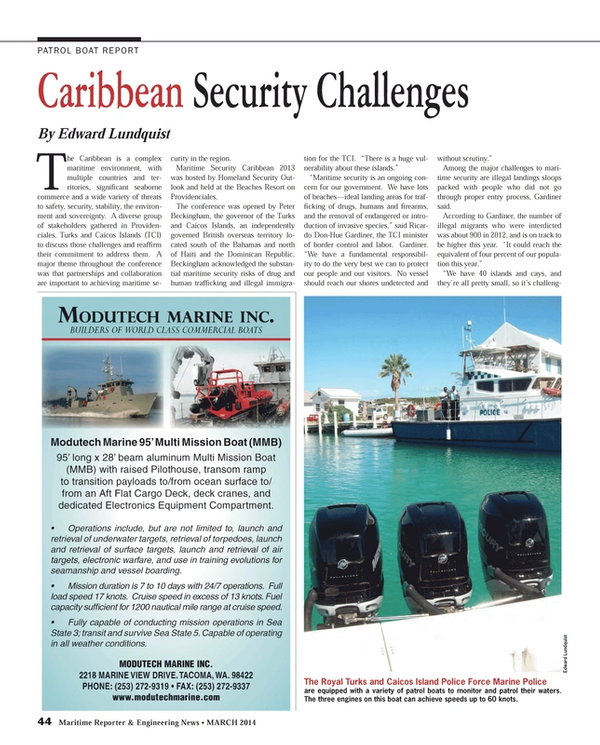 Maritime Security Caribbean 2013 was hosted by Homeland Security Outlook and held at the Beaches Resort on Providenciales. Among the major challenges to maritime security are illegal landings sloops packed with people who did not go through proper entry process, Gardiner said. Because of the radar system, many of those sloops and other vessels have been detected, and their illegal passengers processed and repatriated. Technology, and in particular a high-resolution surface surveillance radar, is improving the ability of TCI authorities to monitor local waters and respond to potential threats. According to Rodman Johnson, radar supervisor for the TCI, the radar has not only helped detect illegal traffic, but it has also helped with navigational warnings and help to render assistance to more than 30 vessels in distress. Of major concern to the TCI are hard-to-detect sloops from Haiti. The Haitian sloops are 30- to 35-ft. wooden boats, usually loaded with people and low in the water. Jim Moore of Terma North America says the Terma Scanter 2001 radar at Providenciales demonstrates the value of a high-resolution radar to detect small, “non-cooperative” targets in harsh weather and sea state conditions. Now that the TCI has a very effective high-resolution surface surveillance radar, the TCI Marine Police has been able to change its tactics and improve their effectiveness and efficiency. Today the Marine Police can rely on the TCI’s coastal surveillance radar to alert them to a potential threat, and dispatch a smaller, more economical boat to investigate when needed. The Royal Turks and Caicos Island Police Force Marine Police also have a twin-engine aircraft for surveillance purposes, but there currently is no way to combine the radar picture with what the boats or aircraft are seeing, nor is there an integrated picture at Marine Police HQ to provide for better command and control of all assets. Maritime Reporter joined Sgt. Glenroy Mitchell and Constable Danneri Belliard on a daytime mission underway along the south side of Providenciales island, over towards West Caicos and then down to French Cay, before returning to the Marine Police headquarters at South Dock. According to Inspector Everet Warrican, the Marine Police have crews in Provo and Grand Turk. Three boats are based at Provo, including the new Sea Protector, equipped with three 300-hp Mercury outboard engines. Belliard, Sea Protector’s coxswain, says the boat can achieve speeds up to 60 knots, with a cruising speed of 30 knots at 3,200 RPM. Some mother ships come up from Haiti and the Dominican Republic and put a number of small boats in the water. A common practice it to pour bleach into the reef to get the fish to come out and be caught. That not only destroys the fish, but it kills the coral and other marine life. “Since the radar became operational, we go out when we have something to investigate,” said Mitchell. We arrive off French Cay, where we see several fishing boats and a few dive charter boats with tourists from Provo’s many hotels. There’s also a wreck to the southwest of French Cay, a reminder that these waters can be treacherous. Uninhabited French Cay is a low sandy island with some scrub vegetation, and a navigation aid to keep boats from running aground. The island seems deserted in November, but Belliard says it is alive with birds in January and into May when the albacore and other tuna are nearby, and churning up the schools of flying fish, leaving the birds to help themselves to what’s left. The Marine Police like the advantage that their radar provides. “If you try and do something illegal now, you’ll be spotted,” said Mitchell.